Thank you to Dies R Us! 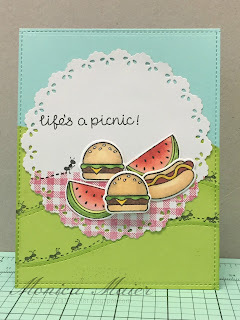 July's theme -- Summer picnics, outings, beach, and things patriotic. 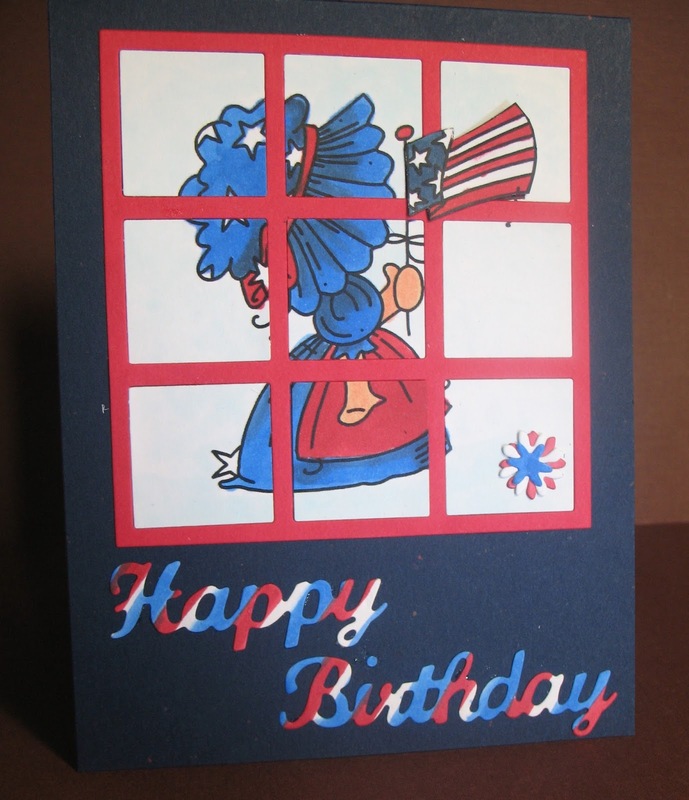 Anytime is a good time for patriotism but July is especially good for Americans. A Thank you for tDies R Us' sponsorship from the Die Cut Divas. Arlene found some paper at Michaels on sale and she loves it. Arlene had to make two cards. She couldn't hold back. Quick and easy does it! You can check these out at A Bit of This and that. Here's Monica with a fresh CAZ style that just says it all. Beautifully cone! 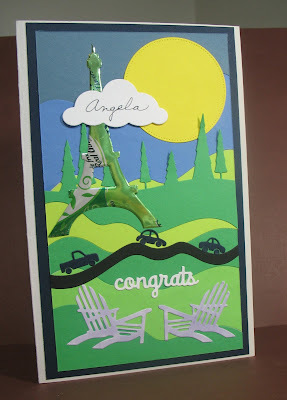 Michelle just rocks these die cuts! Spellbinders Label Sixteen, Impression Obsession flowers. 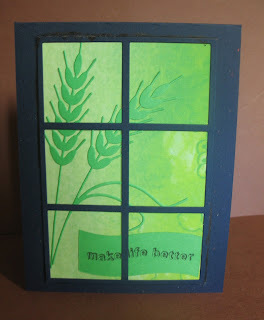 Check out Michelle's blog! Cathie thinking fun out on the beach and sand between the toes! 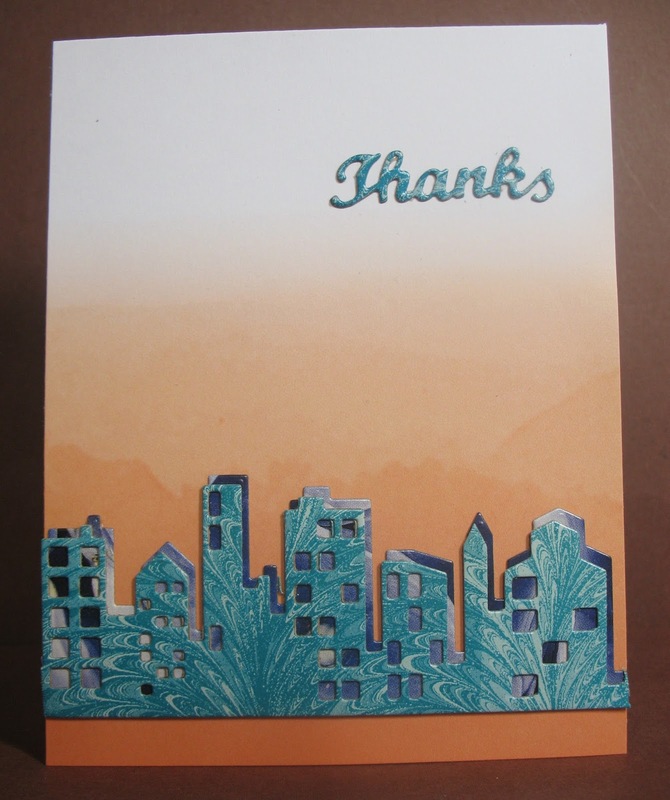 A big Thank you from the Die Cut Divas' to everyone who participated in the challenge and an even bigger thank you to our sponsor for providing great dies and a prize to you all. Arlene here. Hannah asked me to post my latest card here on the 29th, so without further ado. 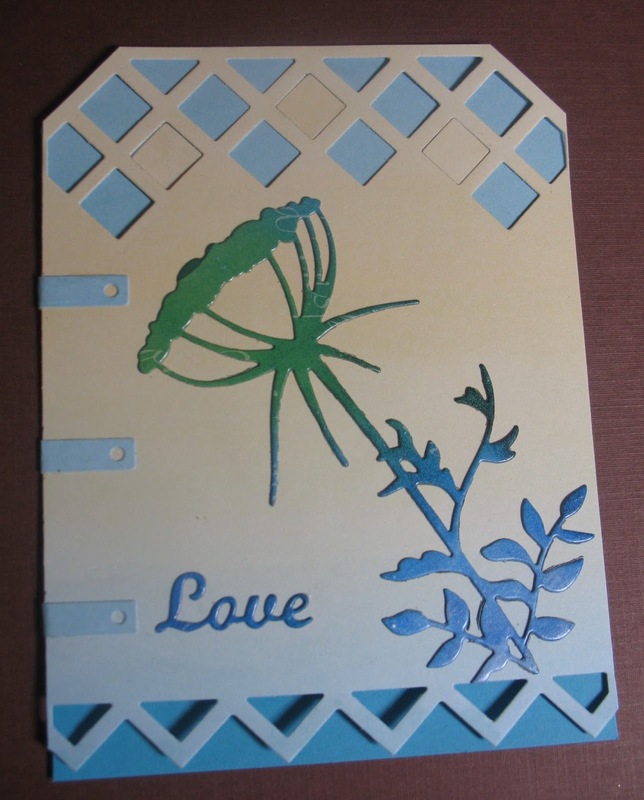 I used a "love" die from Little B "Handwritten" with a beautiful Memory Box Kyle Stem set upon the Elizabeth Crafts Design card front. Inside of Card - you can see the 3 squares I inserted through the hold in the front of the card on the inside panel. I thought it added something extra to the inside. 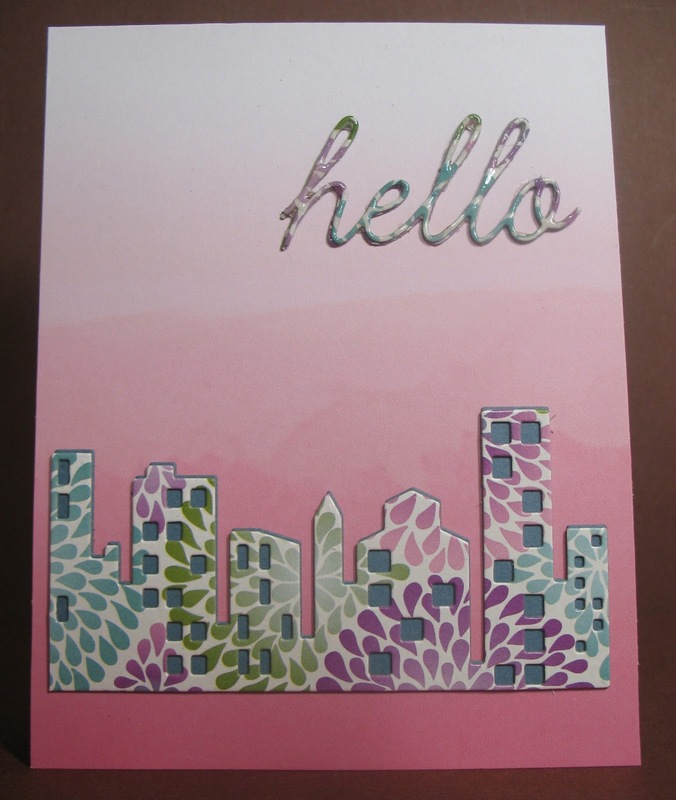 II used the Memory Box Hello Scrpt, A Little B "you" and another Memory Box left-over die-cuts from the Cityscape Nightline on the left side. I have seen the front on another piece of card stock, but wanted to see if this die-cut front piece could function on its own and YES IT CAN! 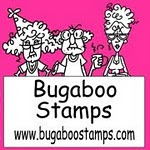 Check out my blog at A Bit of This and That. 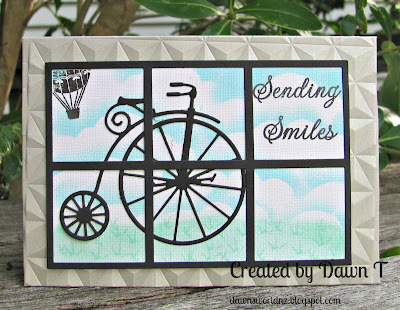 Michelle has brought us the elegance of Paris with this minimalist color scheme and fantastic die from Elizabeth Crafts, makes me want to drop everything and book a ticket. 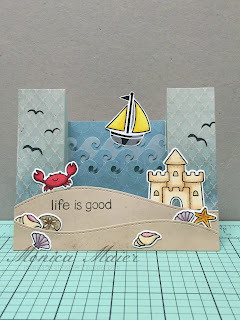 For all the details head over to Michelle's blog Just a Nutter Paper Crafter. Cathie says Hi from her comfy chair on the beach. 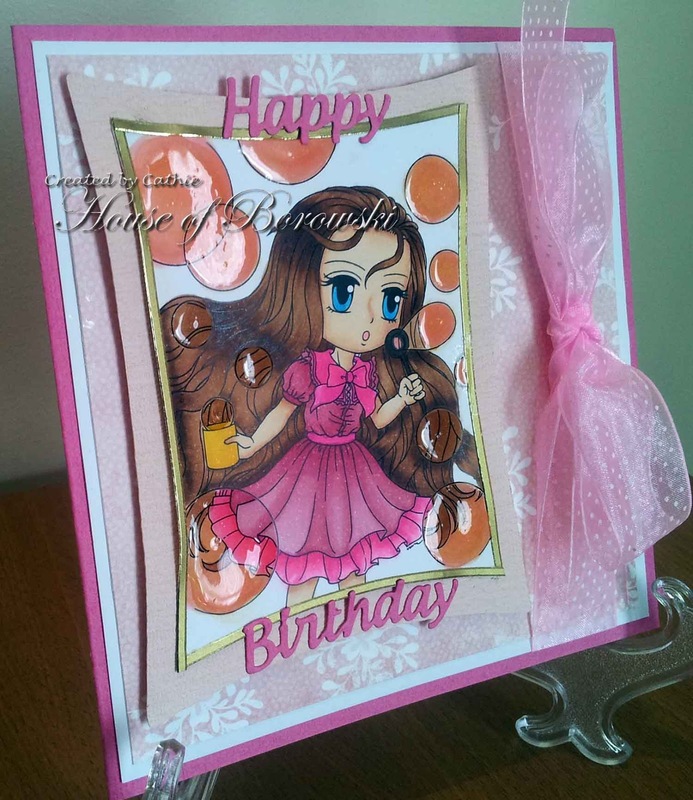 The image she created makes me feel like I'm dreaming I'm in that chair, with the soft colors and tones. 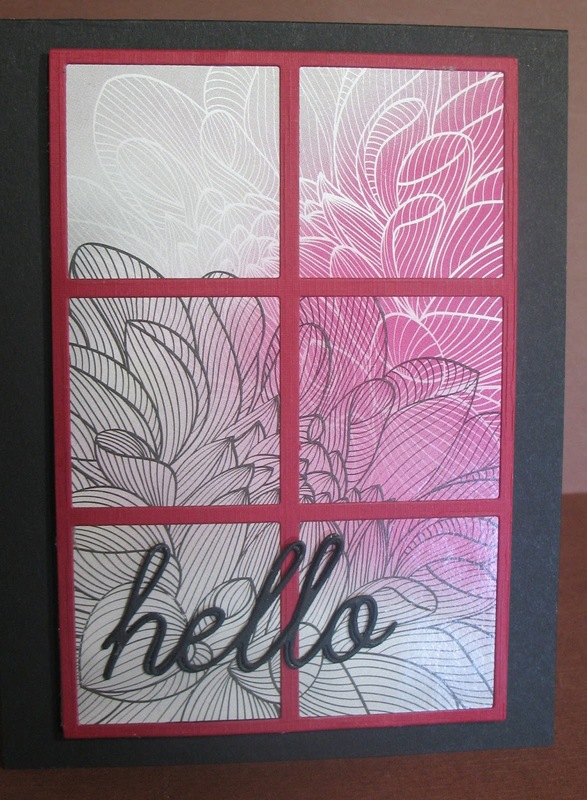 Gina K Design Stamp Set, Simons Says Stamps Pierced Rectangles. She says "I know this next sunshine card is not a summer "activity" but in Western Washington, we celebrate any day that is sunny! " This was supposed to be scheduled for Friday and I'm 2 days late! Anyway I didn't have an eagle image but I thought the Butterfly did a good job resembling freedom. Thank You Dies R Us! Thank you to Dies R Us for their sponsorship. 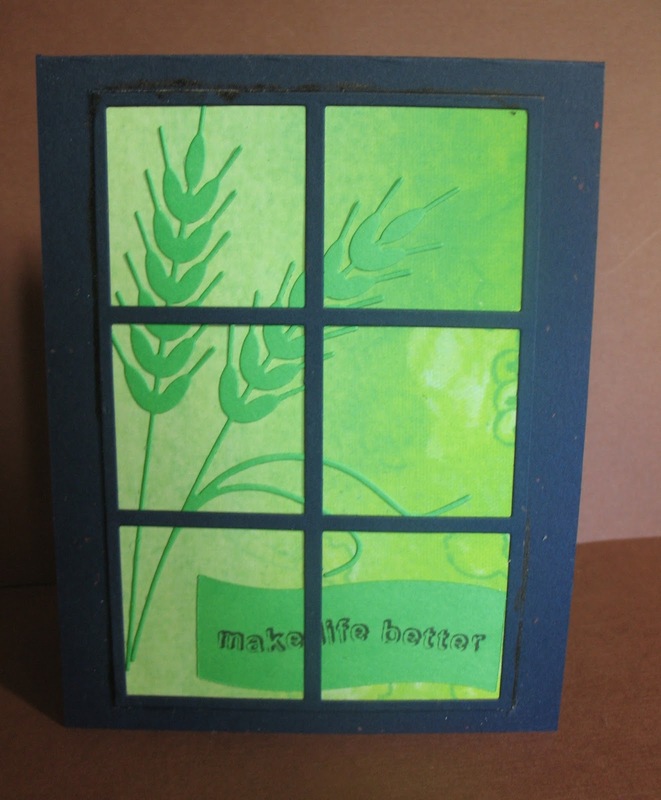 And here is another lovely window card from Arlene! What is this tissue box thing Arlene has? 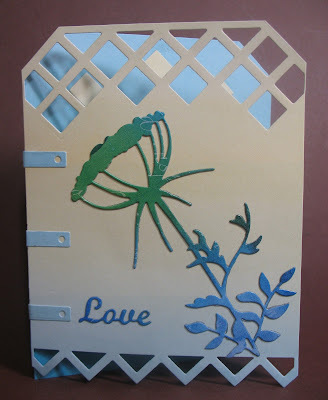 Dies R Us Sponsors Die Cut Divas this month. Arlene is the queen of using lovely patterns from tissue boxes she collects, and the pattern below is no exception. It reminds me of fractal art, its just too bad its not a stamp, because I could see myself using it all the time.... (maybe I need to invest in some tissue boxes of my own :). Sponsor for this of summer challenge. 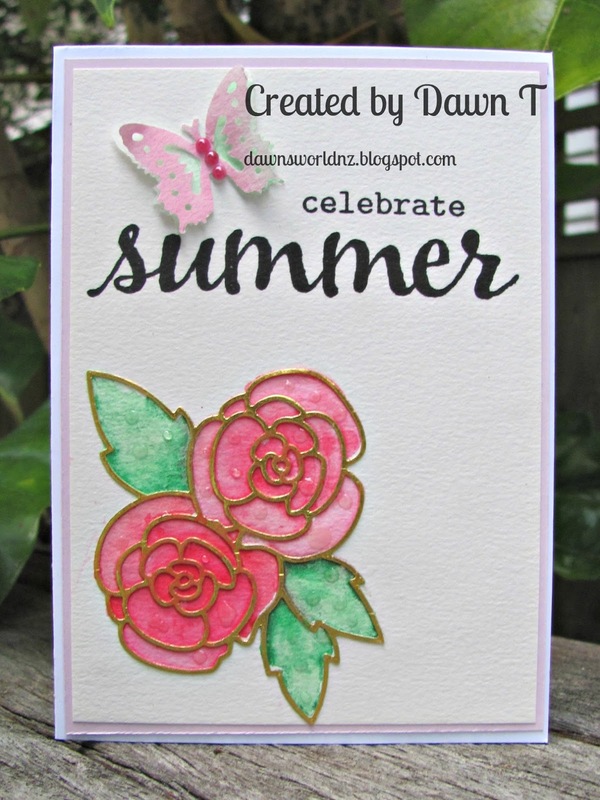 According to google, July is actually the coldest month in New Zealand, but Dawn doesn't seem to let that stop from celebrating summer with us. 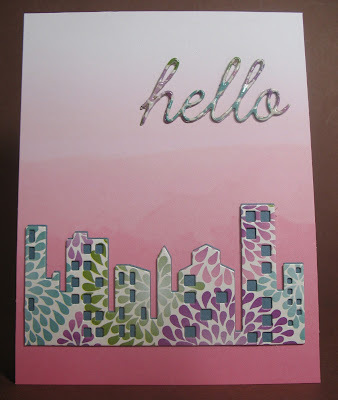 I love the way she water colored within the gardenia die. Have a Wonderful and Safe Holiday with family and friends, and I /we thank you from the bottom of our hearts for each and every one of you in the service, for all you do and have done! Have a Happy 4th of July. Arlene loves the Fancy Sun Bonnet digital images and t teamed the image with a new die she's been playing with. The flag is flying outside the squares. 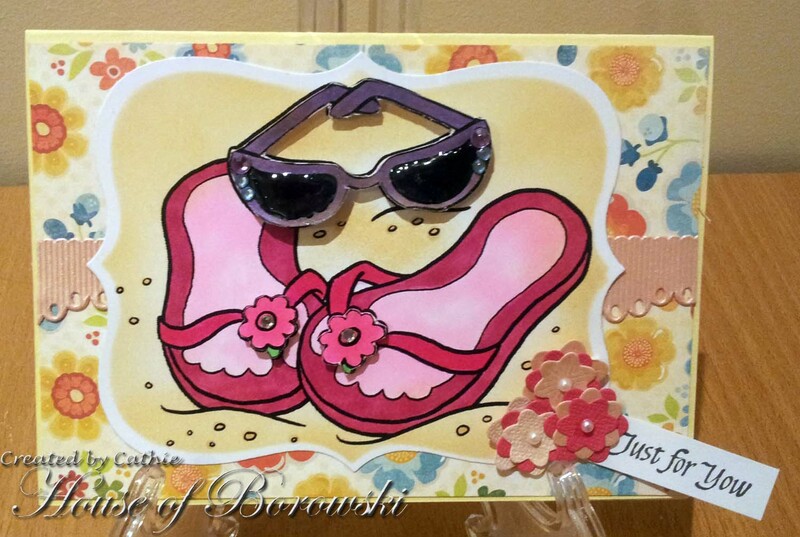 See more at Arlene's A Bit of This and That for more information on how she made this card. July 4th Fireworks Night Sky. Our sponsor for this mont! 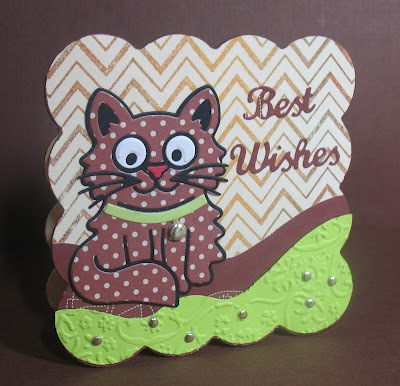 Arlene made a lovely shaped card with a great color combination of brown and green and accented it beautifully with the gold chevron. 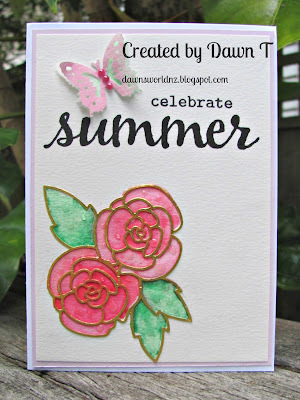 "June Bug" was our June Challenge theme, and we enjoyed all the beautiful projects! I chose the coffee card from KT Fit Kitty. 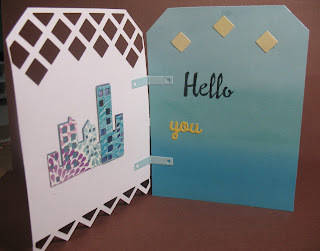 I love coffee cards, and the color combo and different die cuts all combined for a fun card! 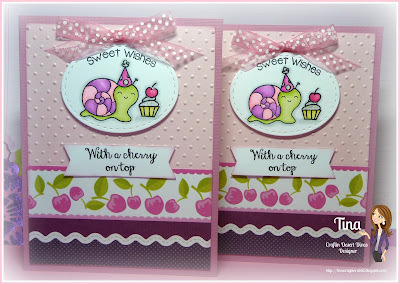 I love the sweet snail and his cupcake with a cherry on top! My favorite is this garden bear.so hard to do fur and this is fantastic. SO DARN CUTE! Good Morning and Happy July! Everyone loves summer right? 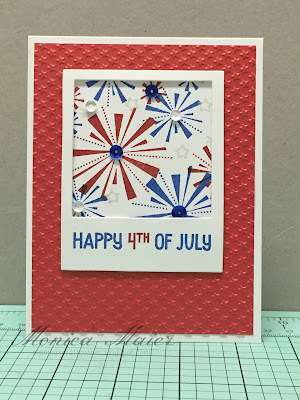 Well this month we are challenging you to come up with cards, pages, or anything else you might have on mind, that say Summer all over, this can be vacations, camping, pool, beach, picnics, and in the USA we will be celebrating our 239th anniversary on July 4th, and we would love to see patriotic creations too. If you are not from the US and want to create a card etc. 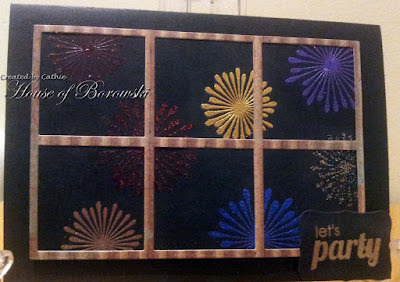 showing your nationalities Patriotism or celebrations, come and join the fun with us! If you are new to our challenges please click on the tab above "challenge rules", and please remember to use at least 1 die cut or embossing folder in your creations. Arlene is up first. and is thinking summer - sitting out in lawn chairs, travelling, taking vacations to other countries. This is for Arlene's friend who is retiring and making plans to relax and then travel. Is that a 7-UP I can see? Dawn seems ready to ride away on her Pennyfarthing. Aren't those old bikes "The Cat's Meow?" 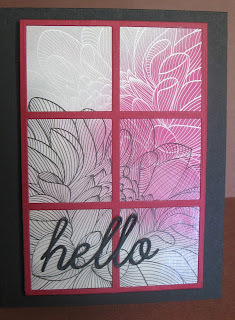 We Are Memory Keepers embossing folder. Marsha really hits us with a way to stay cool under a hot July sun! Monica creates a scene of wonder and delight to set July on it's head. I'd say "Life is Good." Cathie is remembering fun times as a kid with blowing bubbles in the back yard.